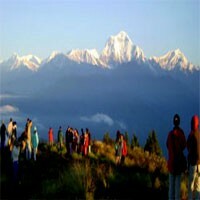 Champadevi day hike itinerary is to the southern Kathmandu valley which starts from Pharping after driving an hour from central Kathmandu. 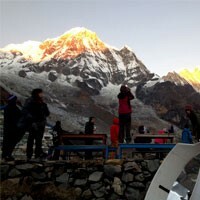 Champadevi day hike is an easy and short day hike near the Kathmandu valley with the beautiful view of the Kathmandu valley, Manaslu, Langtang, Ganesh Himal range in a clear day, birds, wild animals and more. 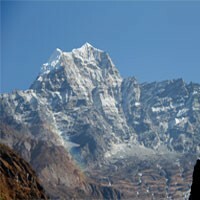 This is a budget day hike in Kathmandu. If you would like to escape from the crowd from the city and be fresh for a couple of hours, Champadevi day hiking itinerary could be the best. This 1-day Champadevi day hike itinerary begins with a drive from your hotel and drops to Pharping than hike few hours to the top of the Champadevi where you see the Champadevi Hindu shrines and Buddhist Stupa with the colourful prayer flags and hike back to the same place or Taudaha, Kritipur according to your fitness. Day 01 : Drive to Pharping, Hike to the Champadevi Hill (2285m.) 2-3 hours. We drive from Kathmandu to Hattiban after our breakfast by private transport with an expert guide and hike to the Champadevi. We cross the beautiful picnic spot of Hattiban and pine forest then hike through the fern bush, rhododendron, and chestnut trees with stone steps. we have the great view of the Kathmandu valley, mountain range and Pharping valley during our hike to Champadevi, There is a Buddhist stupa with prayer flags and the Hindu shrine of Champadevi. after visiting the top of the Champadevi, we again hike back where the car dropped and drive back to Kathmandu. Overnight at the hotel.